Sargent Ponds are located in the approximately 45,000 acre Sargent Ponds Wild Forest and is open to all kind of outdoor activities from mountain biking, hiking, backpacking, fishing, trail running, snowmobiling, snowshoeing, cross-country skiing and hunting. The Sargent Ponds Loop makes for an excellent outing for the entire family. One of the nice things about this loop is it can be hiked in its entirety or only in parts. With three very distinctive ponds along the loop, a visitor could visit one or all of them depending on what they had in mind. For this entire loop it would be required for the hiker to walk North Point Road for 1.5 miles back to their car, unless a second car were available to spot. However, as a visitor to the area a second car might not be an option. With that in mind, the road is a nice walk at the end of a day, but an out and back to Lower Sargent Pond might just be the ticket. Bug repellant close by, water bottles full, boots tied tight, and camera at the ready you’re off. Starting from the eastern trailhead and hiking in a clockwise direction, just because, you have to start someplace. After a surprisingly quick 1.2 miles over a somewhat heavily used trail you will come to a trail intersection, with only one sign. The sign pointing right leads to Lower Sargent Pond; left and unmarked is a 0.2 mile trail to the shore of Upper Sargent Pond. Upper Sargent Pond is worth the short hike, if for no other reason than to just look out over the calm waters. This is a fabulous place for a picnic or to wade out and cool off on a hot day. The waters are very shallow allowing hikers to wade out well beyond what most ponds offer. Returning back to the junction, make this left toward Lower Sargent Pond. This segment of trail is a little more serious with small ups and downs, possible wet crossings, and sections of trail that are very narrow and getting overgrown. 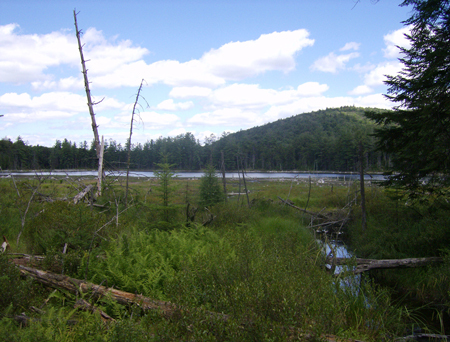 Along this route you will begin to see a long marshy area to your left which is part of Middle Sargent Pond but not actually the pond itself – no trail leads to Middle Sargent Pond. 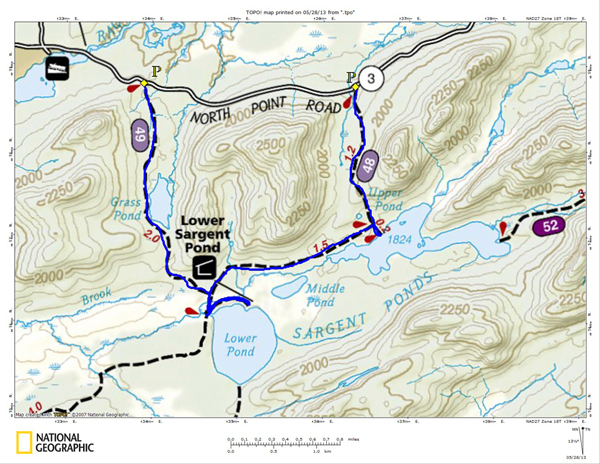 At 2.7 miles you will come to another intersection – right is to Grass Pond (the trail you will need to return to) and left is to Upper Sargent Pond. The sign reads Upper Sargent Pond 0.1 miles. A trail then continues along the northern shore for about 0.2 miles to a lean-to if you wish to see it. 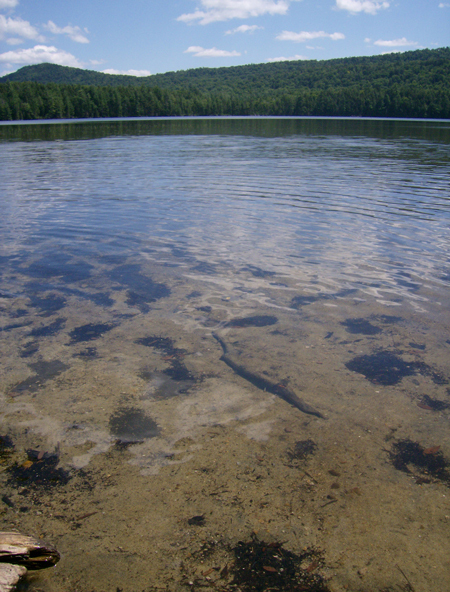 The trail also continues straight and ends at the Shore of Raquette Lake, 4.0 miles away. Retrace your steps to the intersection, take that left and continue the loop. This will bring you along a well-maintained trail toward Grass Pond and the western trailhead. It’s only about 0.6 miles to Grass Pond, whose shore is just that, grass-covered, wet and mossy. It is challenging to reach open water, best left for the ducks. However, with that being said, it is a great place to do a bit of bird watching. Great Blue Herons, red-wing blackbirds, and numerous species of song-birds frequent the tall grasses. The slap of a beaver tail or the laughing cackle of a pileated woodpecker could be heard in the distance. The remaining 1.3 miles to the road is a nice, mellow stroll. Small rolling hills dot the landscape and add to the experience. Once at the North Point Road you will need to get back to your vehicle if a second car was not available. It’s a 1.5 mile walk along the windy, somewhat well-traveled road, back to the other trailhead. You can find these two trailheads off the Forked Lake Road in Long Lake. Start at the three corners in Long Lake drive south toward Blue Mountain Lake on Route 28N/30. North Point Road will be on the right, in 3.0 miles – drive down North Point Road. There will be a fork in the road a few miles in; right leads to Forked Lake Campsite, left to the trailheads. The trailheads will both be marked with state DEC signs on the left side of the road. The first trailhead is at 3.1 miles from the intersection with Forked Lake Road; 1.5 miles separate the two trailheads. This loop makes for an excellent snowshoe trip, as well as a decent cross-country ski outing. Parts of this loop get subtle use from snowmobiles, so it may have track set for you. If not, you can expect heavy snow and fresh powder.